Dance. Movement. Expression. All three words are part of my everyday life, and they have been companions of my soul for the past fifteen years. Through pure movement of the human body, my body, I can express myself better than in any other way. One usually associates dance with clarity and beauty, a performing art that is pleasing to the eye. People go to theatres, concert halls, and outdoor venues to watch dance and appreciate the magnificence that lies in the technique and musicality of the dancers as well as the choreography itself. Most of us fail to realize, however, that dance goes beyond aesthetics. Dance is as powerful a therapeutic art as it is a performing art. Dance can heal and cure people. It can provide a healthy and comforting environment for individuals suffering from psychological disorders, mental retardation, autism, cancer, and other conditions. Dance can set people free on a physical and, especially, a psychological level. It is a means of expressing oneself without any boundaries. In this paper I will focus on the use of dance/movement therapy to deal with major depression, another term for clinical depression. Today, depression is believed to be one of the most common and distinctive mood disorders; yet, people continue to look at depression as a temporary psychological state of mind. People suffering from depression are either too embarrassed to talk about it or remain silent in the hope that someday the heavy load of disappointment and grief they bear will somehow disappear. It is important to understand, though, that depression is not a condition that people can successfully overcome themselves. Depression is a real medical disorder, like anorexia, epilepsy, and autism. It is strongly recommended that people who suffer from depression for long periods of time get professional help. To date, relatively few studies have focused on the effects of dance/movement therapy on people with depression. However, the results have pointed in a positive direction. The down-mood of patients seemed to improve on days they were in therapy as opposed to days they were not. 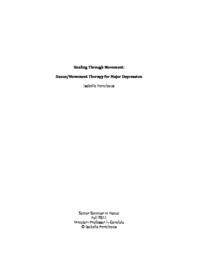 Even if past studies have not closely examined the long-term effects of dance/movement therapy on depression, I have found a number of sources verifying its impact on the lives of people with major depression. I believe that if movement therapists as well as psychotherapists pay close attention to this condition, there will be a significant increase in research on using dance to reduce severe depression and melancholia. Why dose the body with antidepressants or force words out of a person's mouth when there are better methods to treat depression? A significant part of my research is based on looking at past studies of dance/movement therapy on people suffering from this disorder. By comparing the studies and patients' responses, I explain whether dance/movement therapy can really be effective, and how and why it is a better option than medication and talk therapy.